Phil Edwards insists he can replace Ian Sharps in the centre of defence as Burton Albion look to win promotion to League One without their captain. The 28-year-old moved from right-back to centre-half after Sharps was sent-off in Sunday's 1-0 play-off semi-final first-leg win against Southend United. 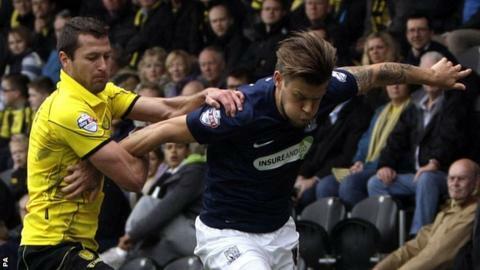 Sharps faces a two-match ban, which would deny him a Wembley final appearance if Burton progress. "As long as I'm playing, I'll play anywhere for the team," said Edwards. Burton were beaten at the semi-final stage last season, losing 5-4 on aggregate to Bradford, while Southend lost to Crewe 3-2 on aggregate at this stage two years ago. He helped ensure Burton take a slender lead into the second leg at Roots Hall on Saturday by heading a Kevan Hurst effort over the bar. The former Rochdale, Accrington and Stevenage man, who finished runner-up to Sharps in the supporters' player of the season award, admitted the sending off on the hour mark, when Burton were trying to press for a second goal, changed the game. "They pinned us in and thankfully we held on with a few good saves [from goalkeeper Dean Lyness] and few good clearances," he told BBC Radio Derby. Brewers manager Gary Rowett praised Edwards' performance alongside Marcus Holness, who has started four successive matches while Shane Cansdell-Sherriff recovers from an Achilles injury. "Again we've had to patch up our defence and sometimes the players you bring in just stand up a bit more," said Rowett. "Phil Edwards has gone in and been a man mountain. He was huge for us and so was Marcus Holness. We need one or two of the players to put those performances in again."